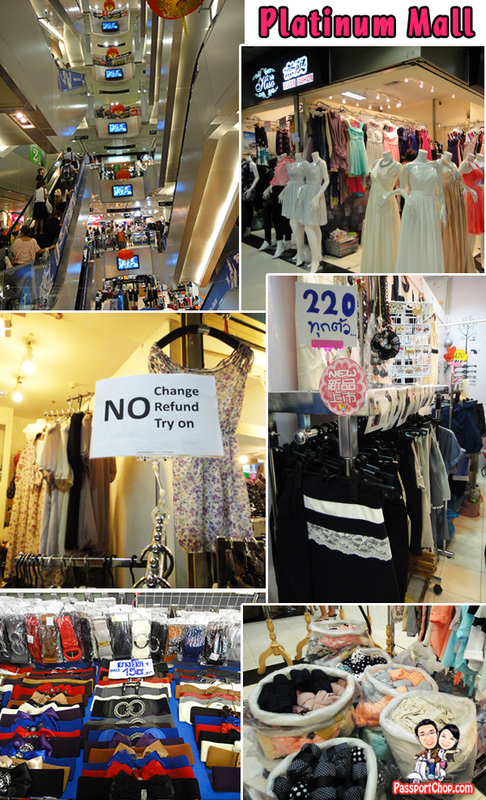 Bangkok is well-known to be a shopping paradise for all kinds of stuff from clothes, accessories to even IT products – not only can you get whatever you want here but you can also get it at a cheap price (if you know how to bargain well). For some tips on bargaining, our previous post on “how to bargain in Hong Kong” also applies here. We will cover just Pratunam and Chinatown in this post. The Pratunam area is well-known for its many shopping centres, open-air market and clothing wholesale distribution centres. Depending on your preference, you can get a wide range of stuff at different prices with very different shopping experiences all within walking distance of each other. Simply take a look at the map below and check out the number of ‘S’ symbols (which stands for shopping malls/markets). Located at the intersection of Ratchaprop and Petchburi roads, the Pratunam Wholesale Market is one of Bangkok’s major markets which sells clothes, shoes and fashion accessories at wholesale prices. This market is open as early as 8am and the busy periods when most shops are open and also when the crowds come in are usually from 11am to 2pm. This market is not for the claustrophobic as the shops are lined along small alleys – just when you thought that’s it for this market, another small alley comes up right around the corner offering more clothes and shoes. You will find all kinds of clothes here from winter jackets, working attire, suits to even outrageous dancing sequined *bling bling* costumes. You can also pick up wallets, belts at reasonable prices – just don’t expect Armani, Gucci quality (even though the brand name seems to indicate so). 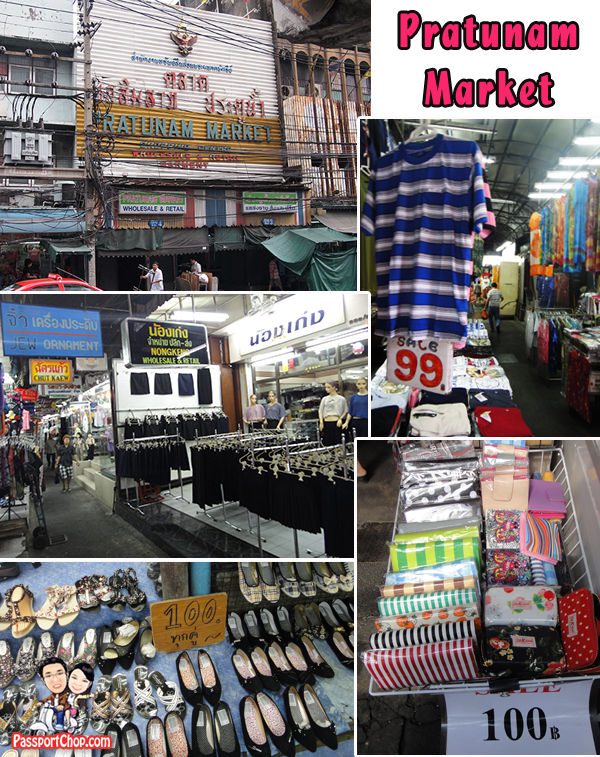 The Pratunam Wholesale Market is located just beside Amari Watergate Hotel where Paul’s Fashion is located. If you prefer shopping in brightly lit air-conditioned malls, just cross the Petchburi road – follow the locals when crossing the road as the cars and motorcycles don’t observe the zebra crossing – and you will find the relatively new shopping centre: Platinum Fashion Mall (most shops open at 11am). Here you will find mainly women’s clothing and fashion accessories spread out across 6 floors (Male fashion take up just one floor). The fashion sense here is quite updated and you might even find clothes here that have yet to make it to the blogshops in Singapore; blogshops are also known to source their clothes from here. This is a wholesale mall so don’t be surprised by the large number of shoppers who bring along huge trolley bags stuffed full with clothes from various outlets in the mall. You can also get items at very reasonable prices – provided you buy in bulk, usually three items and up. The price you pay will be about 30% lower per piece. Some shops allow you to mix different types of items, for example, purses and bags, shirts and trousers. You will sometimes find 2 price tags on the same item – the lower one is the wholesale price; check with the shop assistants on what’s the wholesale price, how many items do you have to buy to enjoy this discounted price and can you mix different items to make up the numbers. No Trying – you are not allowed to try on the clothes; The clothes might be stretched or soiled with multiple trying by walk-in customers; since the bulk of their business is retailers buying in bulk, such stretched clothings will not be “sell-able”. No Refund – As above. If you can’t even swap for another item, don’t bother about refunds. If you are hungry or thirsty after a whole day of shopping, pop by the cafes located at the basement or the food court on Level 5 for a quick bite before continuing your shopping adventure in Platinum Fashion Mall. If you are planning to take a taxi from Platinum Fashion Mall, ignore the taxi stand and just hail a taxi off the road – the taxi queues are usually very long and you will be constantly pestered by taxi and tuk tuk touts waiting by the roadside. The metered taxi fare from VIE Hotel Bangkok to Platinum Mall or Pratunam Wholesale Market is only about 40 Baht. Just a few metres away from Platinum Fashion Mall, you will also find Pantip Plaza which is well-known for its cheap IT accessories and counterfeit versions of software and DVDs. If you are looking for thumbdrives, DVDs, wireless mouse and keyboard, compare prices across different shops and bargain hard for the best deal. Right across town on the other side of Bangkok lies Chinatown – another shopping + food paradise. It will cost about 160 baht (metered fare with no traffic jam) for a taxi ride from Platinum Fashion Mall to Chinatown Sampeng Lane. Here you will find all kinds of fashion accessories e.g. hair bands, scrunchies, clips at wholesale prices (but you will have to buy in bulk – 3 or more pieces). Not all shops here cater to walk-in customers and they usually have minimum orders for 50 or more pieces so unless you have plans to buy 50 hair bands, it’s best to stay away. Shops here close at 6pm so after a busy shopping day in Chinatown, you can check out the many roadside stalls offering seafood and Thai food at reasonable prices. Thanks for the insight, I have been to Malaysia and the shopping mall looks similar! But thanks for the info when I go to Bangkok, and its interesting to know you can have a personal shopper! You can hire personal shopper for the day to show you the best places where to buy what you want (and you usually save compared to the price that a local will pay) , but you can also send personal shoppers to buy what you need for you, and it’s so convenient in a big city !!! A lot cheaper than Dubai and Malaysia, and most of all, the best choice is in Thailand for garment, as these people don’t cheat as in China and know what is quality ! Cool blog. Just wondering, do u ever lost around pratunum market? Any advise not to get lost? Yes its quite easy to get lost in pratunuam market – just ask the shopkeepers and they will point you in the right direction but because there are so many exits – there is a risk of conflicting instructions; if you are not in a hurry, just take your time and just walk straight towards any direction and you will find an exit. Can any body let me know what is hotel stay price in Prutnam market, is that fine hotel available not 4 star or 5 star but reasonably good atmoshper. Do you know of any contact person in Bangkok whom I can engage to buy specific products on my behalf then arrange for delivery to Singapore and Malaysia? Thanks! Could you please advise me where to shop for genuine weft hair extensions and the procedure at the airports? Hi Elaine – for accessories like hair extensions, you can look for them at Sampeng Lane at Chinatown. Hi, Can you help me that let me know somewhere for bussines? i would like to buy ladies’s clothes? where would the right shop i can get with good price? and how much i can carry back to Viet Nam? and Do i have to pay for tax or something else? and Is it safe for going bussines alone there? One more thing, how much is the cost in Baiyoke hotel? lots of infor in internet, i dont know whick one is correctly. Thank you very much. Why don’t you ask the personal shoppers in Bangkok ? They helped to find clothing for my shop, good price and good service, I will use it again soon. For Ladies and Kids clothes, you can find lots of them at Platinum Mall and Pratunuam Market. They are mostly wholesalers and they offer great discounts to people who buy in bulk. There are no particular shop I would recommend as I dont have experience dealing with them in wholesale purchase. Not too sure abt shipping and Baiyoke hotel (can check out asiarooms.com for good rates). Do you know where 2 find branded copy clothes like fred perry,superdry etc in ptatinum/siam/paladium? Don’t think you can find them there. Hi, Neat post. There is a problem along with your web site in web explorer, could check this? IE still is the market chief and a big part of other people will pass over your magnificent writing due to this problem. I am now using IE and there is no problem with this site. Hello Zhiqiang & Tingyi! Thank you for your information! Superb website! Where is the best place for me to buy A4 paper? Arigato! Have a nice day! Is there wholesale on Chinese dried food like fish maw, sea cucumber n on which day n the operating hours. Is it very far to walk to Chinatown if we were to take BTS to Hua Lamphong station in order to avoid the jam? How to beat the jam n save more time? Just walk along Yaowarat Road and you will see lots of these on sale – if you buy more, you shld be able to ask for wholesale price; if you cant get the price you want (reasonable one), just move on to the next stall. Yes. it is quite far to walk to Chinatown from Hua Lamphong station – maybe 15 – 20 minutes; can take a Tuk-tuk (shld bargain not more than 30 Baht) Take a metered taxi but taxi will be caught in the jam. Hi, could you please recommend reasonable hotel around Pratunam area? Is Glow Pratunam nearby please? How do I get to Pratunam area from the Airport. Glow is nearby. If you are into shopping, you can consider Novotel Platinum – located right on top of Platinum Mall zone 3 – you can shop til you drop and then put your shopping back in your hotel (just walking distance) and then continue shopping! The 28.6km Suvarnabhumi Airport Rail Link has two trains — City Line and Express Line. The City Line starts from the Phraya Thai Airport Link station. It costs 15 baht per person until the end of year (15-45 baht after that), leaves every 15 minutes, stops at all eight SARL stations along the way to the airport and makes the journey in 30 minutes. Runs 24 hours a day. The Express Line leaves from the main Makkasan SARL station and travels directly to Suvarnabhumi Airport, costs 100 baht (150 baht from January 1, 2020), leaves every 30 minutes and makes the journey in 15 minutes. Runs from 6am to 1am. From Phraya Thai station, you can take a cab to your hotel in Pratunam area – shld be quite cheap – about 3-5 Sing dollars. Thank you once again for your kind recommendation. Is there a train from the airport to town? If yes, kindly advise the name of the train station to get off. The stop to get off will depend on where you want to go. You can walk for AIRPORT LINK STATION to PLATINUM, it is around 500 meters only. Indra hotel is good and cheap on AGODA. Thanks to all for your kind recommendation. a lot. I hope to give something again and aid others such as you helped me. Hi. i will go to bangkong for holiday and i want to bring gift for my friend who is crazy about 2pm-nichkhun. where can i buy 2pm stuff i mean korean pop stuff in bangkok? thanks! I havent seen 2pm stuff in Bangkok but maybe you can try Mah Boon Krong where they sell almost anything. Heya i’m for the first time here. I came across this board and I in finding It truly useful & it helped me out a lot. I hope to offer something back and help others such as you aided me. I am looking for the best place to purchase fashion accesseries and cloths. That I can put at markets to sell. Can you guys advise me where is the best and cheap places. The nearest BTS station to Chinatown is Hua Lamphong. However, it will involve a lot of walking to the station from Shanghai Mansion. I suggest you either bargain with a tuk-tuk or just take a metered taxi to Platinum Mall direct or to Hua Lamphong BTS. If you choose the latter, then you should get off at BTS Chidlom or Ratchetewi station. Both of which will involve at least a 1 km walk to Platinum Mall. May I ask any good massage house near shanghai mansion hotel? Had you tried this restaurant called “Vietnamese and More”? If u have, may I know is it within walking distance from shanghai mansion hotel? Is there any spa services in sha ghai mansion hotel? Hi, can you suggest me where i can buy motorcycle accessories and merchandize in whoelsale. I am looking for stuff like motorcycle tshirts, helmets, protective gear, wallets, caps, stickers, keychains and so on..I want to retail these here in my market. Indira market is very nicely. I recently shown this market. I again and again visit this mall. Is there a cargo to india?what are the charges and how long does it take? Plz let me know…much appreciated. hello! can you help me find suppliers for the passport holders and other small leather items. i am interested to start a business of personalized passport holders, etc. just like the ones in bangkok.